After teaching two kids to read, I feel like I have a better handle on how I want to approach this with the queen. With the first two I tried all sorts of programs, and quickly realized a program was not what I needed - the only things I needed were time, maturity on their part, patience on my part, and a handful of index cards. This time, I am not going to waste my time with any programs, I am just going to introduce the letters slowly and have fun. So, I am going to try to share our reading journey here. The plan is to introduce one letter at a time along with the life of a saint, similar to Serendipity's Alphabet Path. As I plan each letter, I will post my ideas and welcome any ideas you all may have! We will not be following the order of the alphabet for our program, since that is not very conducive to reading (how many words can you read with a,b,c and d :). Since my goal is to have her sounding out words as soon as she is ready, I have ordered the letters with that in mind. Also, I have chosen to present the letters that are easiest to blend first, since this skill can be difficult for some children. 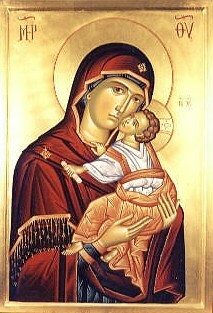 So, with that in mind, what better way to start our school year than with the blessed Theotokos! The Church begins and ends the year with feasts to the Theotokos, so that is where we will begin too. We are following Katherine's plans for the Dormition, and gradually working our way into the school year by the end of August, but our letter study will probably wait until the first of September. Since the Queen was born on the Nativity of the Theotokos, it seems like the perfect time to begin her lessons! We will not read as many books this week, since we are spending most of August learning about Mary. I LOVE this! Thanks for sharing your flash cards. I am really excited about this and cannot wait to print the alphabet cards! I have been looking for something like this:) Thank you! I'm happy to have found your blog. I plan to use some of the Alphabet Path with my daughter this year, as well as a Child's Garden of the Theotokos. I look forward to looking around your blog more. I have been SO SO scared about how to begin with homeschooling. Obviously, my little one has a little time before we really get started, but you have given me such hope! Thank you for sharing what I know must have taken you much time to create; seems unfair for you to do all the work and me to click print! Anyway, I am so thankful for you as a sister and a fellow mother. Thanks for making this not quite so scary for someone who can dwell on anything long enough to make it terrifying.